Our October Networking breakfast was held at the brand new Table Café at the Lifestyle Centre in Bredasdorp. The topic was Save money in half an hour, presented by our very own and talented Joh-Mari van Heerden from Lloyd George Design & Print. Below is a short extract from her talk. Before you start with a marketing strategy determine first what is your market, and niche market. This will determine where and in which print format you’ll distribute – magazines, flyers, etc. Your advert needs to stand out from your competitors if you want to get noticed. Plan a year in advance, and take action 6 weeks before your material is due. This will ensure you get good quality at a good price. Below is a diagram that explains this well. 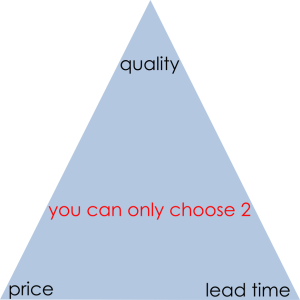 You can only choose two of the three, if your lead time is short, you will compromise on quality or price. Next you have to think about Size, Type of paper, Colours – Full colour or Black & white? Remember quality affects the price. If you want to save on quality it means looking at a lighter grammage, but 128g is your limit. Never compromise on your design! Quoting what Joh-Mari said about designing logos – “As I told the plumber. I will not put a toilet on your logo!”. What promotions do you choose to do? Newspapers are better for promoting Specials, and Magazines are better for Branding. Use your company email address, e.g. anita@business4women.co.za instead of your gmail or yahoo account, when sending business emails. Don’t try and do everything, find an expert. With print promotions, make sure you always include your location and contact details.